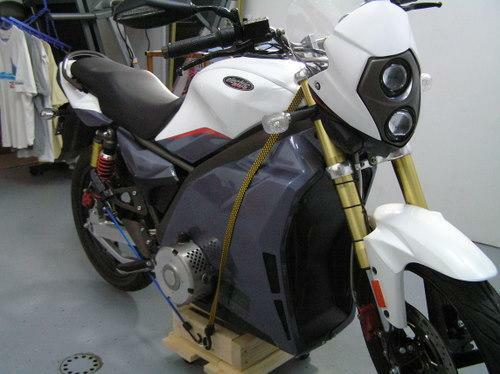 Electric motorcycle conversions are here today! 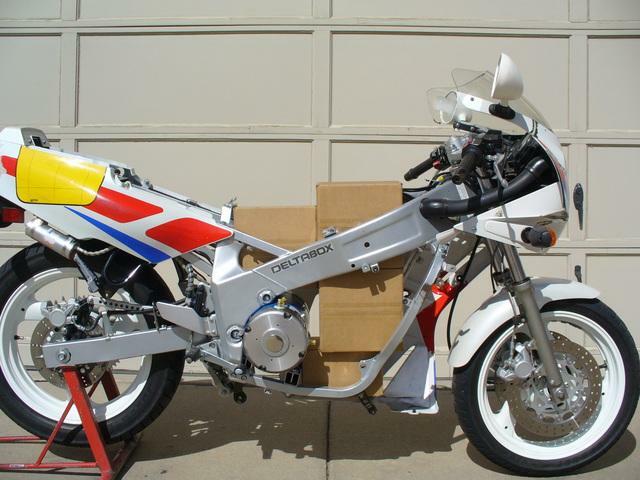 D&D Motor Systems the premier electric motorcycle motor manufacturer in the U.S. for doing a motorcycle conversion to electric. 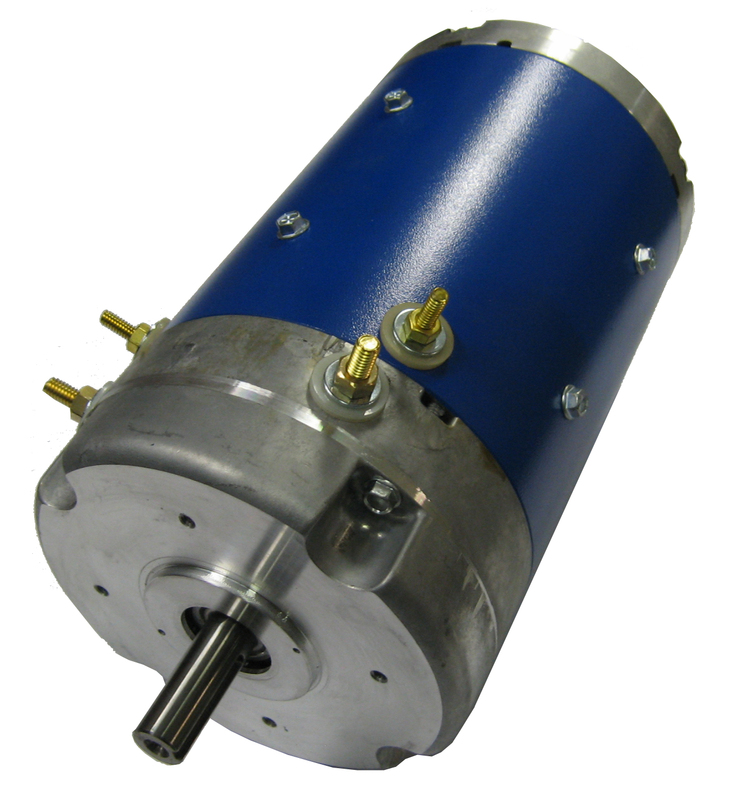 Our electric motorcycle motor offers higher performance than the pancake motors that are out there. 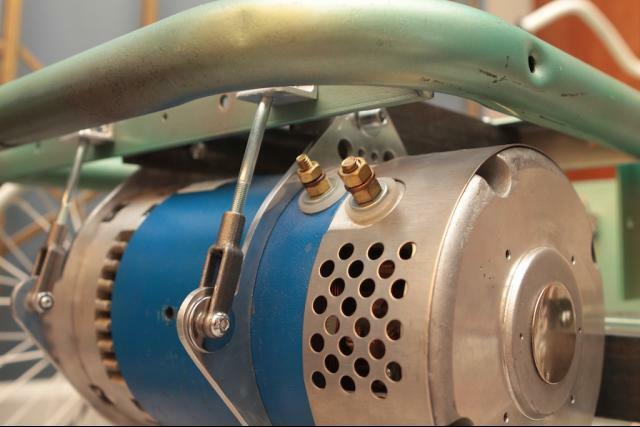 Our electric motorcycle motor has: higher torque better thermal capabilities and a competitive price. In addition, we offer a complete line of U.S. made electric motorcycle controller to go with our electric motorcycle motor . Kick the oil habit now. It's a lot more practical than you think. This isn't a dream of the future. 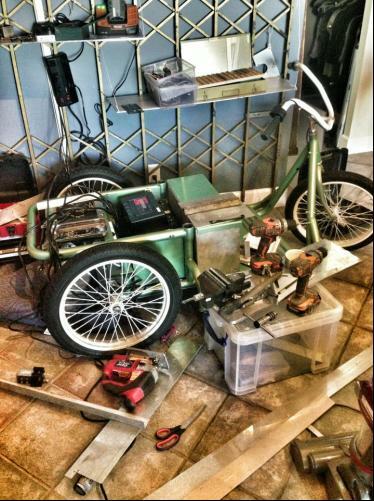 With a little effort, electric motorcycle conversions are here today! At a cost you can afford! • Take a look at some examples pictured below. 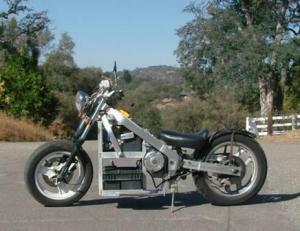 Click the electric motorcycle conversion to view details. 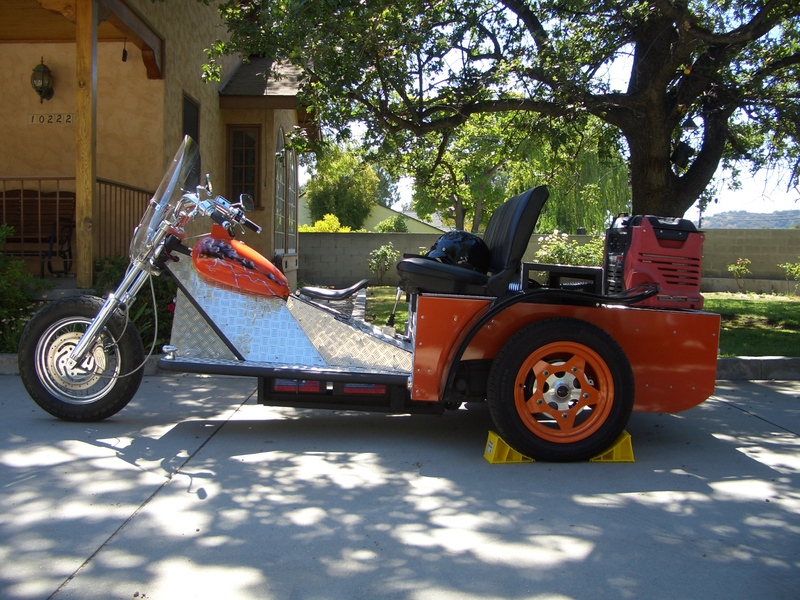 72 Volt 12 Amp for traction pack. 2 Amp for auxilary battery. Both mounted under the tank. 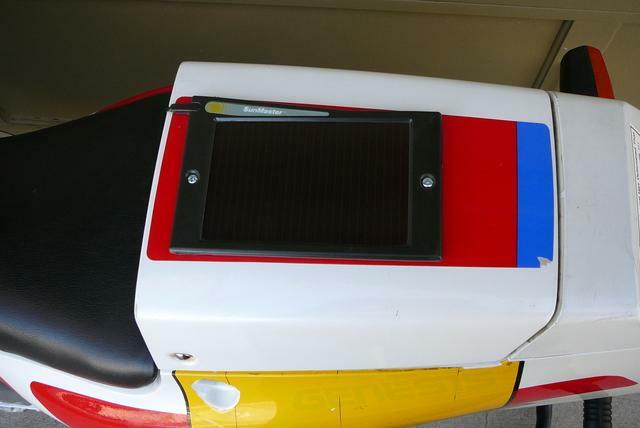 CasaDelGato battery monitor of each battery with warning lights in the dash using fuel and Oil lights. Amp meter on motor circuit too. running in 2 months, 6 months to refine. It's got new paint now. I can't get on or off without someone wanting to stop and talk to me about it. Pulls really well - barely gets warm! 85 ah (about $45 each). Four on board chargers - one for each battery. Six amps each. Disconnected it - really decreased my range! Tapping 12 volts for now. Bicycle speedometer (stock one was broken). Generic multimeter. That's it! Will install battery meter soon. 6:1 Gear ratio so top speed is limited. Excellent acceleration - quite quick! Still testing - not much. About 50 hours labor over about 3 months. But TONS of hours looking at Austinev, YouTube, and other websites getting ideas! Chose the Alltrax Controller because it comes with free software to adjust motor power, throttle rate, etc. Can also print a history of what happened (amps used, voltages, throttle positions, etc). For a video summary of this project, go to www.YouTube.com and enter QUITGAS in the searchbox. power than the equivalent sepex or PM. max- 76 nominal. Integrated BMS. spare...but well have to see. 50 mi- so thats my guess. 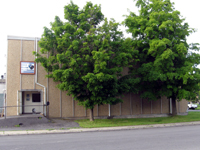 ends- but it is together and running. little pimpin gold around the edges. 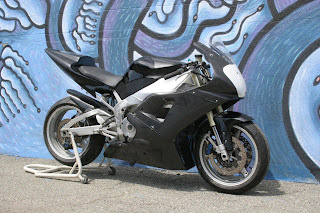 2009 Electric Motorsport GPR-S Street legal bike up to ~70 mph with 15-tooth sprocket. Fun bike thats easy to ride. 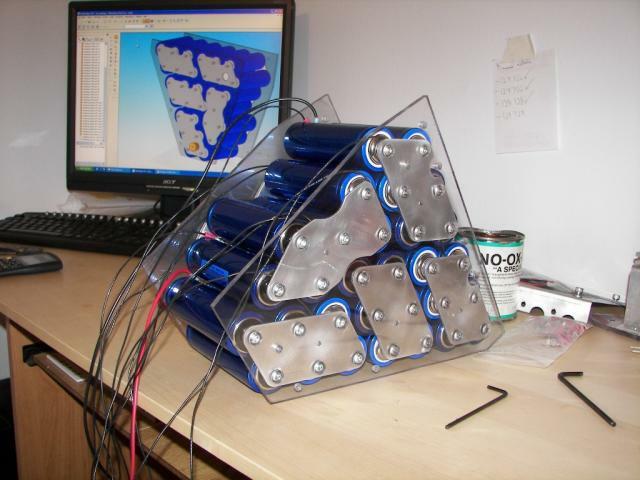 The original configuration was with SLA cells. Range was too short so I upgraded to LFPs. Its much more useful now. One of the great features of the GPR-S is its modularity and flexibility. 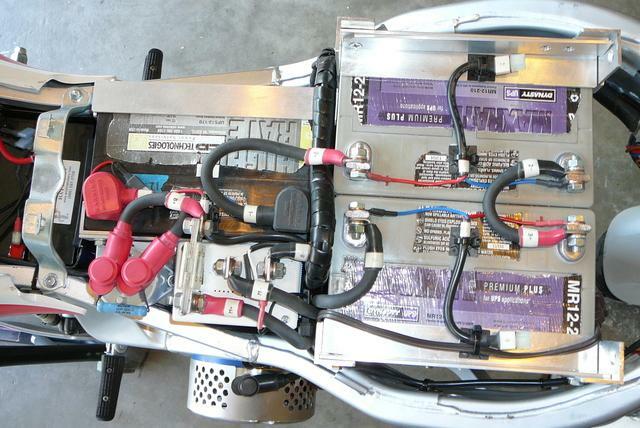 Few other bikes even have the option to upgrade to a completely different battery chemistry. 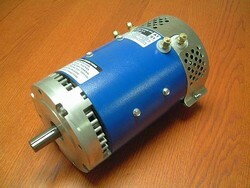 Direct drive D&D Sepex regen motor with Sevcon PowerPak. 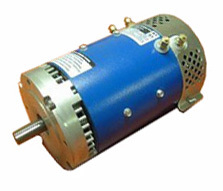 Up to 25hp / 4500 rpm. Upgraded from SLA to LFP which tripled the range. Getting support from EMS has been a struggle. Around $2000 so far, not including the bike witch was one of my old road race bikes. Bicycle speedometer (stock one was broken). Generic multimeter. Thats it! Will install battery meter soon. About 50 hours labor over about 3 months. But TONS of hours looking at Austinev- YouTube- and other websites getting ideas! Chose the Alltrax Controller because it comes with free software to adjust motor power- throttle rate- etc. Can also print a history of what happened (amps used- voltages- throttle positions- etc). For a video summary of this project- go to www.YouTube.com and enter QUITGAS in the searchbox. 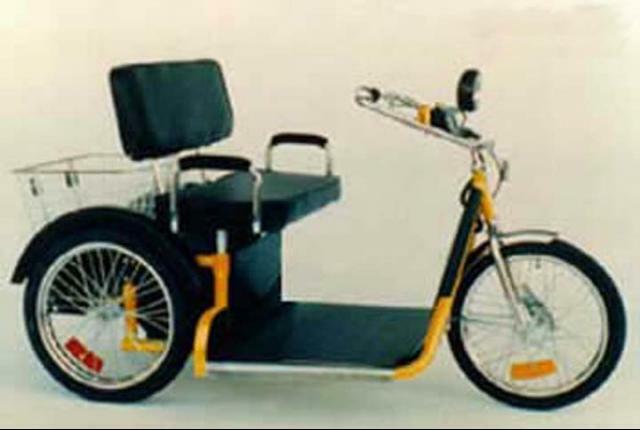 1985 Twosome Palmer senior mobility devices. with a 1" go kart differential from Northern Tools. combined two Zero motorcycle packs. Powder coated everything. Awoooogah horn. Silver faux leather seats. Will build new bike this winter lighter weight etc. tire had dug into his grass. The thing was rusted in a locked up position. 13HP regen and reverse. Capable of ~300A. 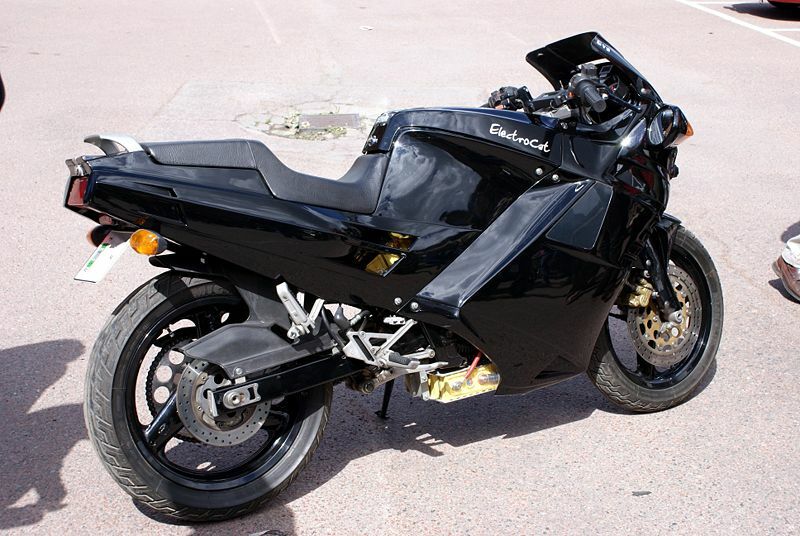 Id liken it to a 250cc bikes power- though when and how they make power are different. 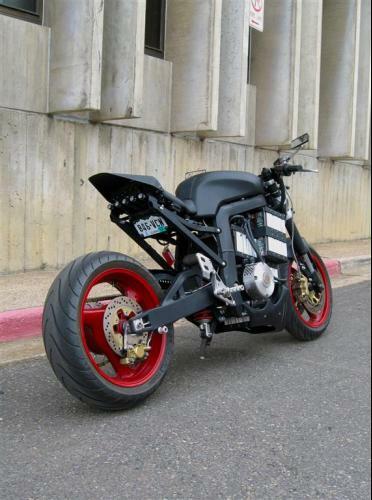 If I had gears like a Honda rebel itd be no contest. One speed- 420 chain. 12/60 gears. The whole pack is 100AH at 48V. Do far ive gone 20 mile son it- so no clue on real range- though I suspect its over 60 mi in mixed driving. Update soon. Slick Little fellow works well. 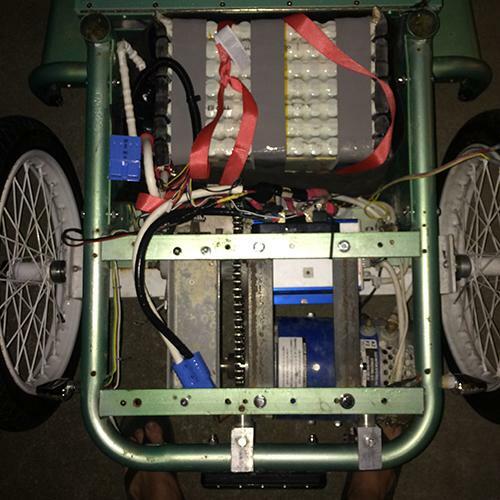 after first rides- the batteries are within 30mv of each other. CellLog monitors on all cells. 48v cart gauge for overall pack at a glance is mounted to the tank. The top speed is around 55 mph so far. Only the Interstate and highways around NWA are over 40mph- so I have enough go-power to get a speeding ticket just about everywhere in my range. confidence inspiring- and really quite good. Will update with solid scientific information soon. tbd. instrumentation is lacking. Only have a battery meter. some on sale rubber from oldbikebarn.com front tire came with the e-bayed rim. This is the bikes Revision 2.0 Anything I Know I did wrong the first time I have corrected but Im sure there is more to learn. 3-4000$ from scratch. almost all of that is EV pats. TH lead acid version was half that. The bike has had the rear brake deleted and shaved down the old brackets so now the regen motor does all rear braking. extra special thanks to my wife! right angle gearbox custom with 15-41 sprocket for 4.1:1 ratio. He have move this summer for the 36 volts ride. The gear box work fine. Onboard. They monitor pack during discharge. After test at 84v (14% less power): 0-50 under 5 sec. 0-62 mph in about 10 sec. Low center of gravity. Excellent maneuverability. Very fun bike to ride. My first electric motorcycle & definitely loving it. Electric Motorsport sells vehicles & a wide variety of components for your EV needs. 56 Lbs each- VERY difficult making these fit in a 600CC bike! I can pull away from stop lights quicker than most ICE cars. Pulls hard to 45 MPH- then tapers off up to 55 MPH. Max range is 25 miles cruising between 45-55 MPH- with medium sized hills. So far I have 650 miles on it. I ride when ever possible. 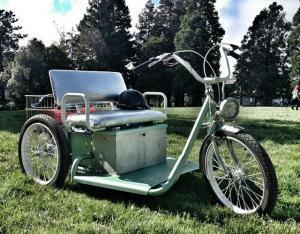 You may think the 75 AH batteries are too heavy- but I like the range- acceleration and the average speed I can maintain. I tried my best to make the bike look factory stock. I am enjoying this project and I am extremely happy with it. This was a huge learning curve. I made some errors in component selection- about $200 in money spent incorrectly. Could have been much worse! This bike is great fun and the torque and acceleration is a blast on the twisty back roads. I can enjoy riding with my wife to church or to the ice cream parlor and taking my son to the Scout meetings. No scooter can compare to the range and performance for the money. Things will only get better when LiFePo batteries become affordable. Advice: BUILD ONE NOW! dont wait until LiFePO batts are available. If you want to cruise at 50 MPH- size your components for 70MPH. 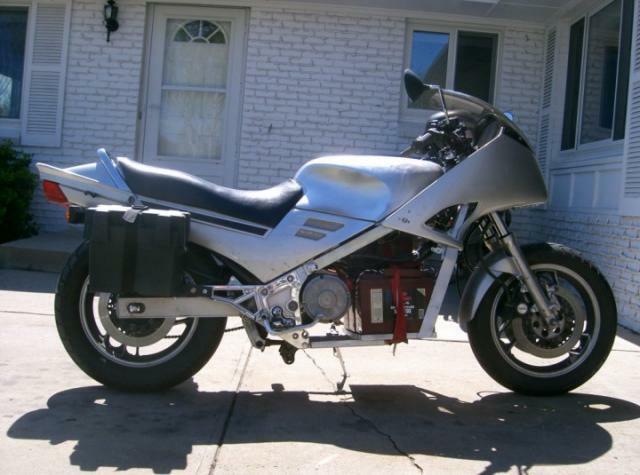 I would suggest a 900 CC frame for a bike with more than 48 Volts. Do the research and call the suppliers of the products before you order. I have found that EVERY EV supplier has been willing to ensure you have the correct components rather than getting your money. 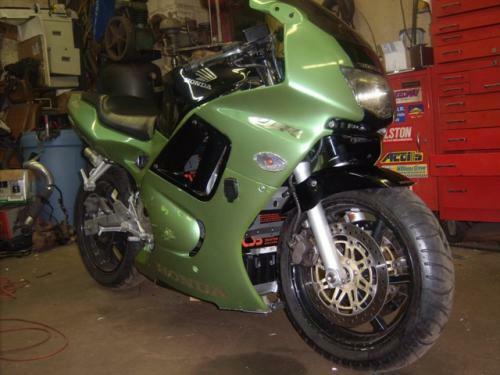 Buy your donor bike from Craigs list in the middle of winter! Sell the ICE parts on E-bay! 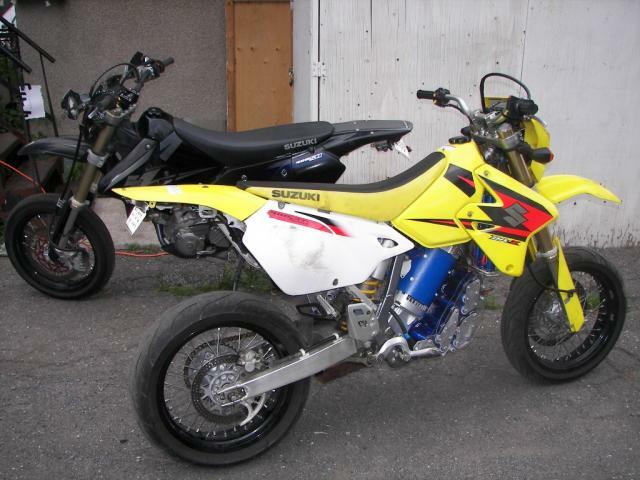 Before you buy the bike- search E-bay to see what the parts are selling for in the same condition. You should be able to calculate your potential return on your investment. Dont buy a bike that is in need of restoration. Buy a good quality running bike so after the conversion it will have maximum value and long life. with a 1C capacity of 25Ah- I didnt expect much more than 10 mi- but my most recent trip surpassed expectations! I went ~11 mi and my pack was still around 74V! 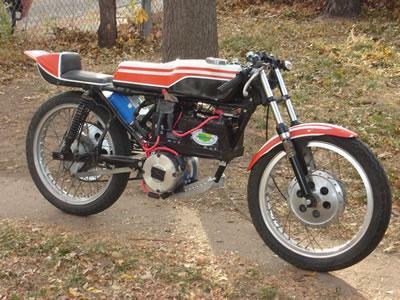 This was a Formula IV road-race bike with a 2-cylinder 2-stroke engine- putting out 29-hp with Vesco pipes. It weighed 180 lb dry and topped out at about 130mph (at 13-000 rpm). In 1976- when the reed-valve engines came in- I parked this bike at the back of the garage. 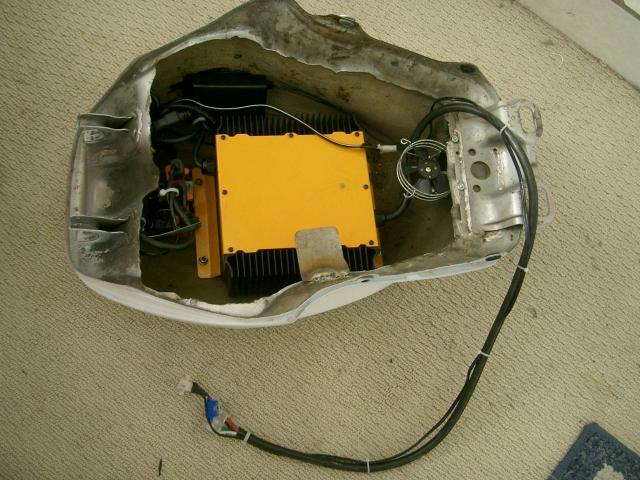 In 2008- I disinterred it- dropped the engine and bolted in a golf cart motor running 48 v. With small SLA batteries it weighs 210 lb. Mike Dieroff at D&D was very helpful -- responded promptly to my email- took my phone call and specified a motor that turned out to fit perfectly. No cutting or welding required: I just made a couple of aluminum cradle arms. Alltrax folks also very helpful -- very responsive when I had to track down a fault in the wiring harness I had built (turned out to be a short across a switch). Cheap SLA batteries- $38 each from Battery Mart. Hope to replace these with a LiFe pack next summer. 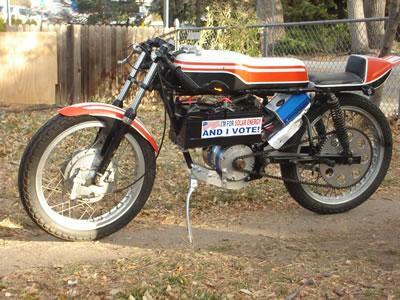 Not registered so Im riding it as if it were a moped -- 30 mph limit. In theory its geared for 60 and Ive gone that fast downhill. Going downhill the bike itself should be stable and safe beyond 90 mph but the motor is supposed to have a 4500 rpm limit. The bike is fun as hell. Havent pushed it beyond 4.5 miles yet -- the distance to the office. City streets- traffic lights- stop signs- mild hills- SUVs. 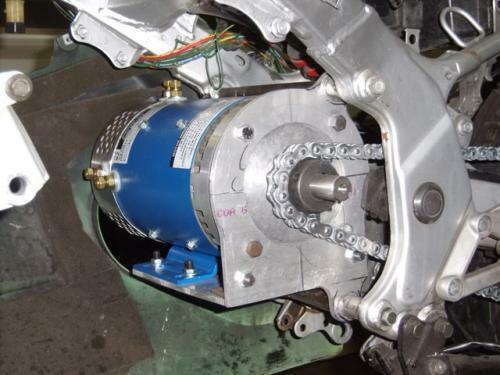 Original massive drum brakes aid regenerative braking. Original racing-crouch riding position with clip-on bars and rear-set pegs. With no clutch or shifter- theres not much for three limbs to do. Bicycle LED head and tail lights. Bike is still sprung for 90+ mph so its a little harsh on pavement seams. Steering lock is limited so care must be taken maneuvering in parking lots. Mar. 5: Back in operation for the spring. Batteries are good for only about four miles if air temp is below 40 degrees F. LiFe batteries may fix this. Dec 10: Parked for the winter- with the charger on a timer so it gets a little juice each night. Nov 24: Running reliably. I can ride it to work whenever the morning temp is over 38 degrees Fahrenheit and the pavement dry. Side panels are in place so the bike looks pretty nice- finally. Nov 12: Hard freeze last night and it wasnt kind to the batteries. I barely made it to work. I may have to bring the bike indoors at night -- my garage is unheated. Nov 6: The bike is running just fine. A short across the throttle switch kept the controller from booting- and it took a few days to diagnose. Controller now boots instantly. Clocks have changed and Im coming home in the dark- but Ill commute as long as the streets are dry. Meanwhile- as long as I had the wiring apart- I cut a hole in the bottom of the tank to provide clearance for the controller and a place to hide some of the cables. Looks a lot cleaner now. Sept 30: Rewired to get all the bits under cover. Its a tight fit. Acquired a gold-plated fuse holder for the 250-amp ANN fuse and found room for it on top of the battery stack. Sept 23: Want an original dolphin fairing to hide the mechanicals- and I also need to weatherproof (that is- hide) the snake nest of wiring. Sept 20: Commencing daily commute- amongst the migrating SUVs. Feel like a gazelle amongst elephants. Controller sometimes takes awhile to boot -- something is sporadic in there. I only work 3 miles from home but with gas prices getting out of control, I thought it would be great to have an electric motorcycle. 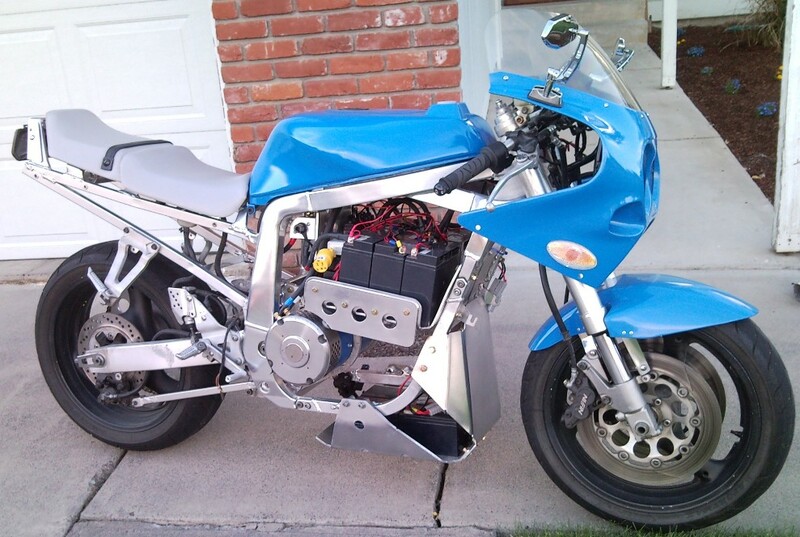 I've always wanted an electric motorcycle and decided that doing an electric motorcycle conversion with an electric motorcycle motor would be a good EV project, keeping costs down, and be fun to ride. This project took about 3 months of research and development (not counting waiting for parts to come in or help from a friend with the welding). 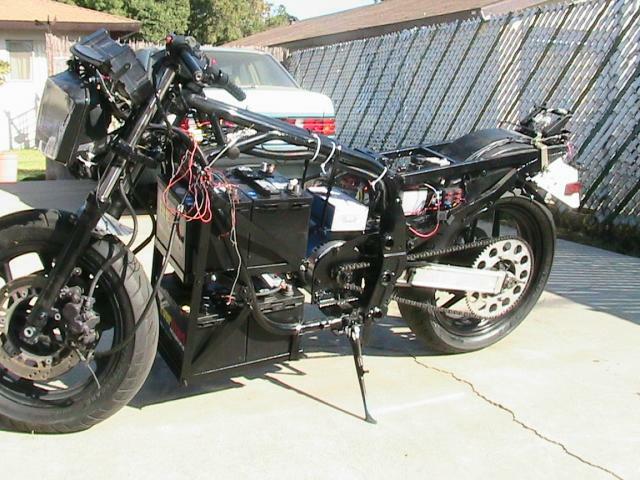 All in all, it cost about $3000 to build an electric motorcycle with a high performance electric motorcycle motor. This may take a long time to pay off in gas savings, but if you add the fun of building and all of the environmental benefits, it was well worth the effort. 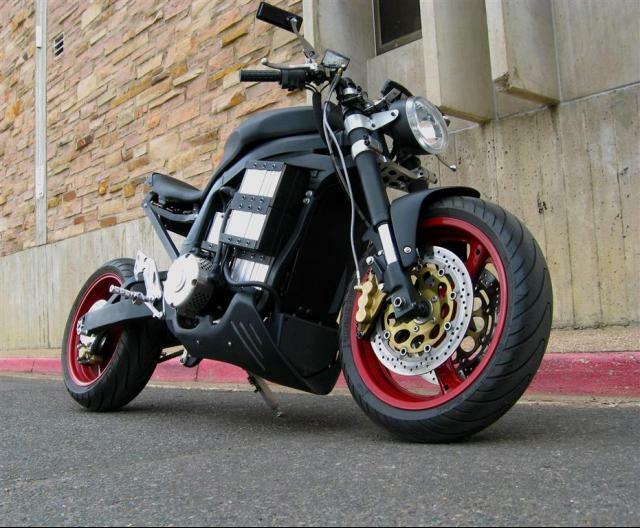 With a top electric motorcycle motor speed of over 70 mph and 10 miles per charge, this electric motorcycle is perfect for me. The following instructable will not give you exact step by step instructions, but if you have some mechanical skills and welding ability you should be okay. 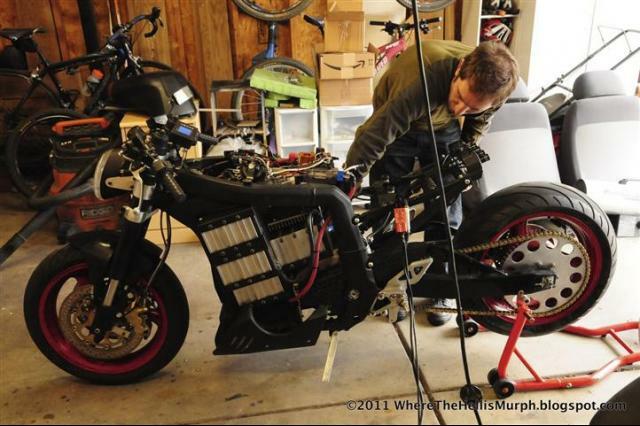 A little knowledge of electric motorcycle motor maintenance wouldn't hurt, too. However, I just read the user's manual and learned as I went. 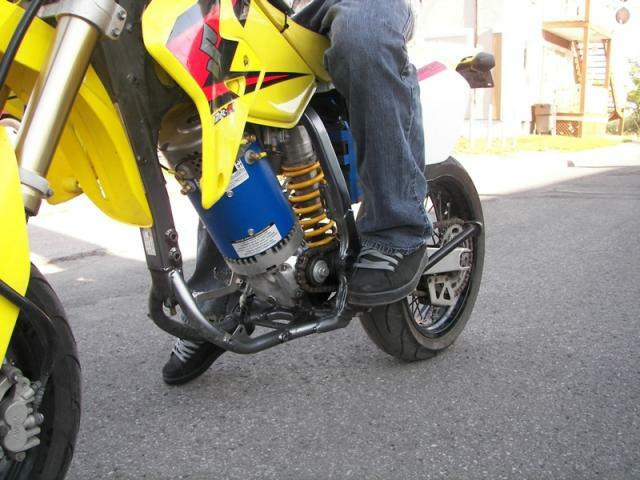 Every motorbike is different but the basic components can be the same. Below is a list of the parts I used and where I got them, but you will have to do some research to figure out what fits your bike and requirements. Check out the electric motorcycle photos at the bottom to see what I bought and the EVAlbum for other electric motorcycle conversions. 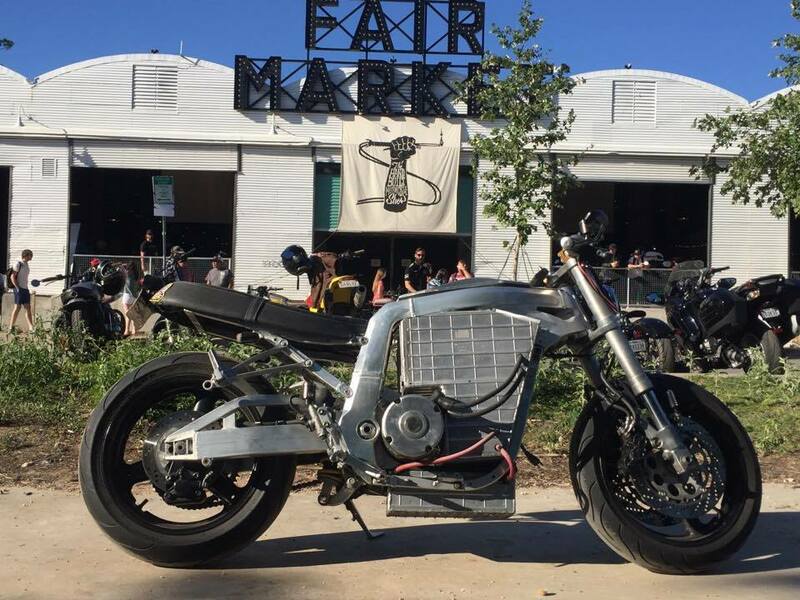 1) I like the style of bike, not a total crotch rocket but not a hog either, with room for electric motorcycle batteries inside the frame. 2) The seller on Ebay was close to my house. 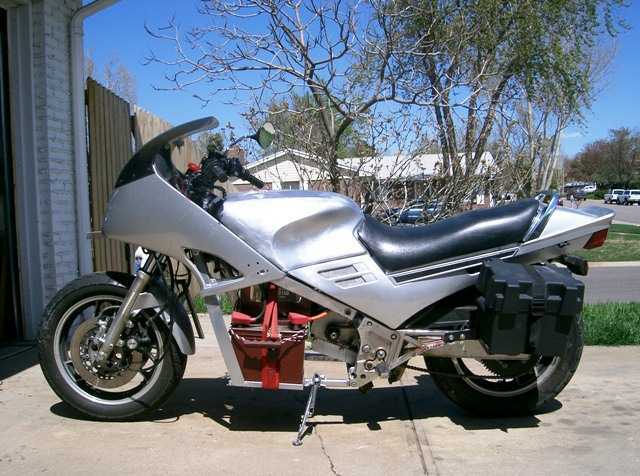 And the bike didn't run, so it only cost $600 which is a perfect price for your first time electric motorcycle conversion . If you have an old bike or someone will donate one then that's great--but for the rest of us, try the local paper, junk yards, Craig's List or ebay motors. 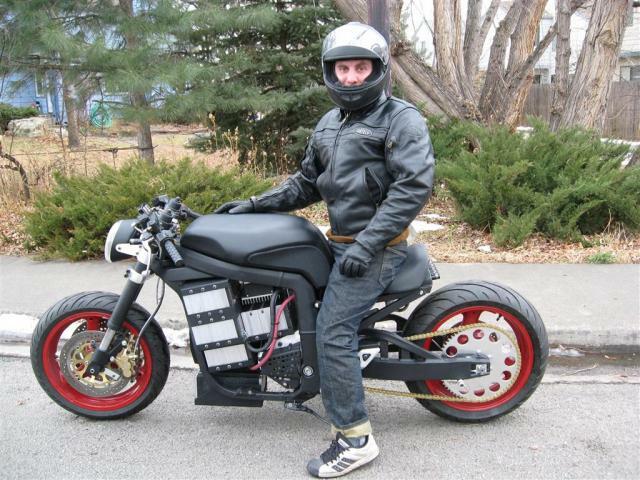 After reading other electric motorcycle conversion specs (and knowing that I wanted to go faster than a moped), I chose a 72V electric motorcycle motor(D&D Motorsystems carries many options), because it's weight and dimensions where good for my frame. Electric Motorcycle Batteries: I went with 6 Yellow Top Optima batteries from remybattery.com because they are sealed and have received great reviews. After making cardboard mock ups of the D23 model I realized that there was no way six full sized batteries would fit and still look good. I ended up getting the D51 model. Half the size and weight but also half the storage. Electric Motorcycle Controller: You have to match your electric motorcycle controller to your voltage but the amperage is up to your budget. More amps = more power and more cost. It seems that there are only two real choices: Alltrax or Curtis. You'll have to decide for yourself, but I went with the 72V 450Amp Alltrax. 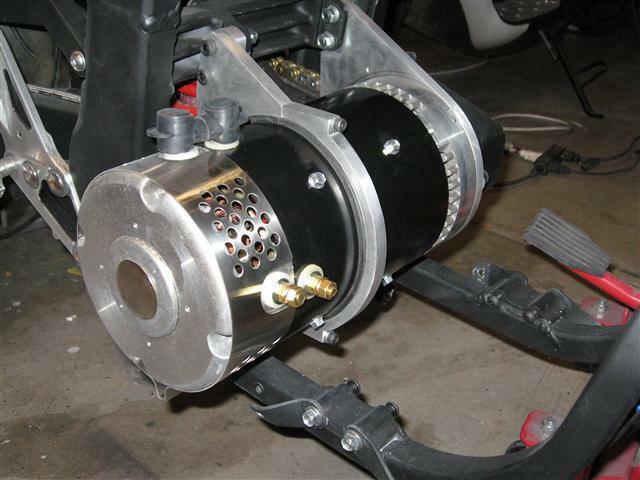 (D&D Motor Systems carries these) Don't waste your time trying to build a potimeter on an old throttle--just buy a pre-made one and be done with it. I got the Magura 0-5K Twist grip throttle. 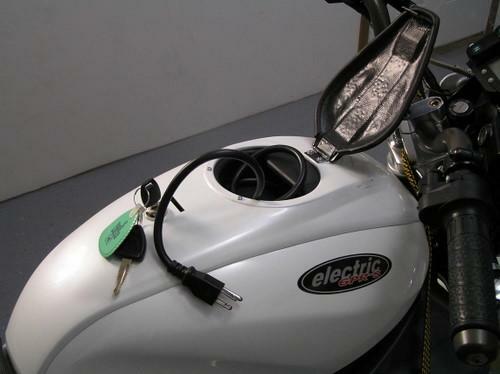 Electric Motorcycle Charger: You have to match your charger with your voltage but the speed of charge in Amps is also up to your budget. I went with a Zivan NG1 but I have recently switched to six individual 3amp Soneil chargers to help balance the batteries. 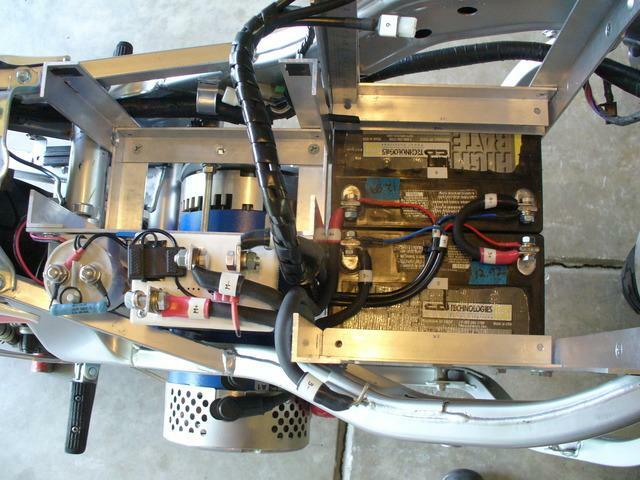 Electric Motorcycle DC/DC Converter: It's safest to run with a DC/DC converter and an extra 12V battery backup but motorcycles have limited space so I am only using the converter. I purchased a Sevcon 72V Input 13.5V output from evparts and it has working perfectly. Electric Motorcycle Battery cable and connectors- I bought about 10 feet of 2 GA wire from WAL-MART and cut it to length. Using Lugs, I soldered and used heat shrink tubing on each end. I highly recommend battery terminal covers for safety. Electric Motorcycle Instruments I chose an E-meter(Link 10) w/ Prescaler add on for 72V use instead of a bunch of different meters. As an added feature I wired up the ignition switch to the neutral indicator to show me when the bike was on. Basic shop tools are required such as a socket set, screw drivers,wire stripper, etc. 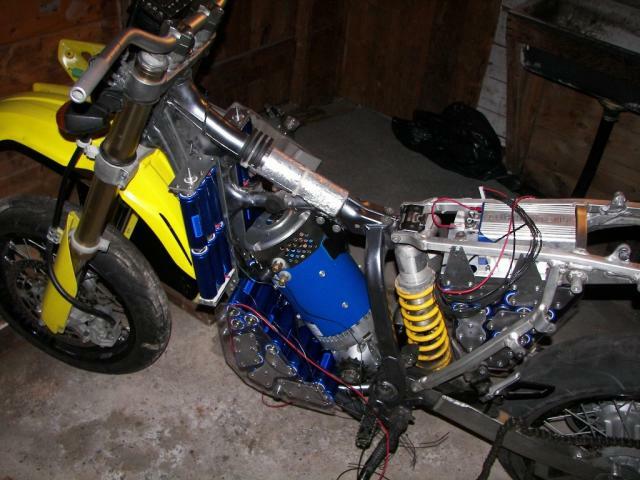 Additionally a volt meter, metal grinder and crimper are used in this electric motorcycle conversion project. 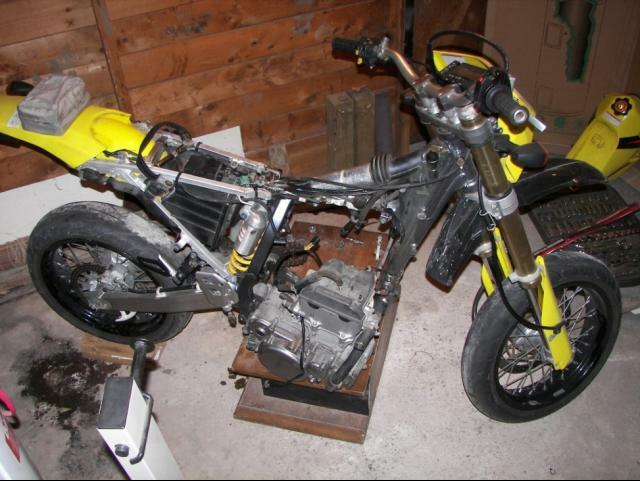 Start the electric motorcycle conversion by removing all of those nasty internal combustion engine parts. 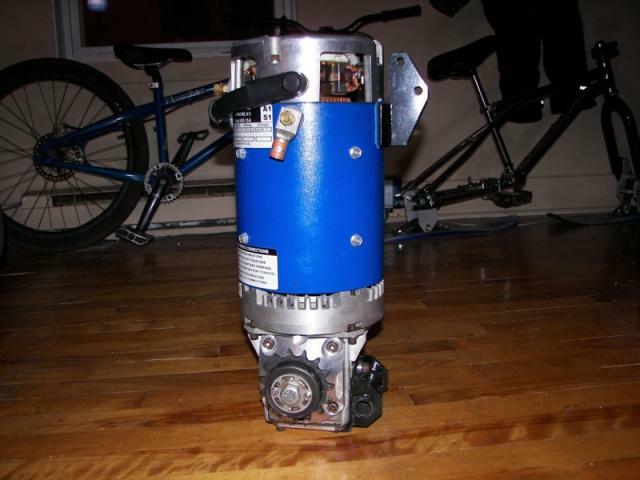 Remove the gas tank and using your grinder or other cutting tool to cut out the bottom. This makes room for extra batteries or components. 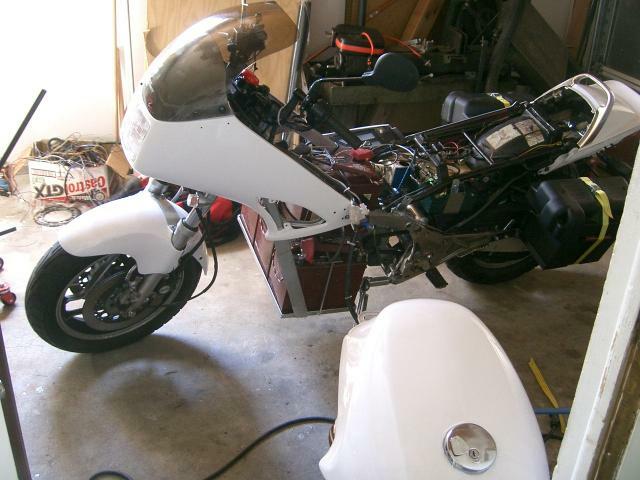 (Make sure all gas is out before cutting) Reference your owners manual often during any electric motorcycle conversions so that you don't cut any necessary wires, and try to sell some of the parts to help pay for this electric motorcycle conversion project. Next, make cardboard mock ups of all of your batteries and electronic components to see how and where things are going to fit. 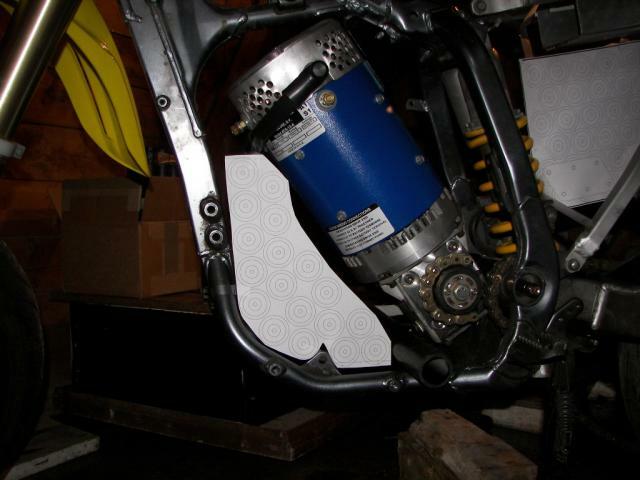 Take a look at my electric motorcycle conversions pictures to see how I fit everything, believe me that taking the time to make accurate cardboard mock ups is well worth the effort. Now for the hard part. 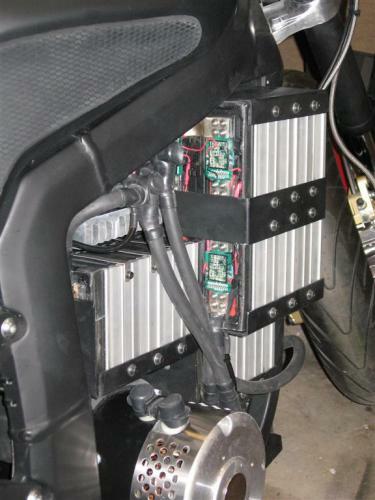 You need a secure battery box and electric motorcycle motor mount for any electric motorcycle conversion. I had a friend weld it up for me and he did a fantastic job. From the photos you can see that he first strung up the electric motorcycle motor to allow for minor adjustment to be made before cutting the electric motorcycle motor mount plate. After that was cut he made a nice chain and sprocket enclosure with a door and welded them onto the frame. Next he fabricated the battery rack and gave each battery a swing arm closure to give a tight fit yet still allow me to get them out easily. Half inch foam padding spacers are between each battery to help cushion the stack--but believe me, they aren't going anywhere. The last thing he did was weld in metal plates for mounting my electric motorcycle motor. 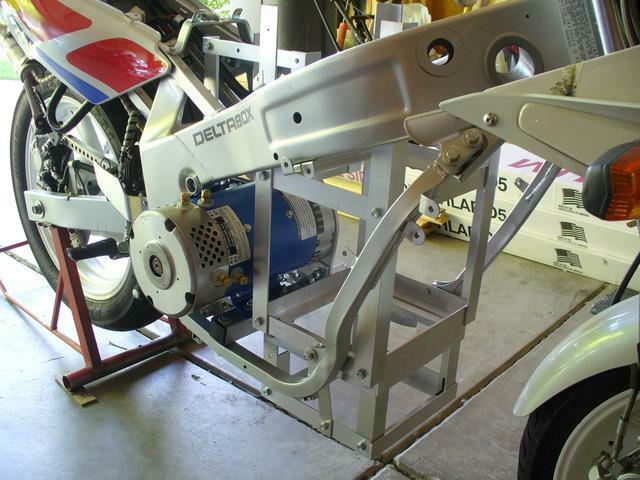 After you get your electric motorcycle motor mount and battery compartment all welded up, take some time to clean up the frame of your bike. I removed any rust spots and chipped paint that I could find. Then I used some metallic gray and black spray paint. This makes a world of difference and costs very little. I made a fake gas cap and ran the power cord from the charger up the frame and out the top. 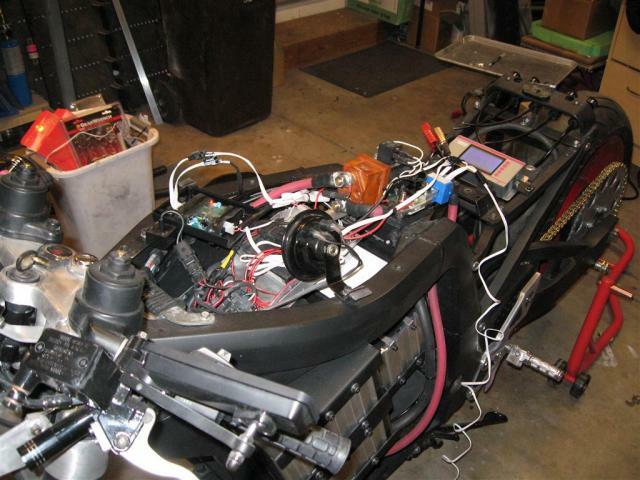 Now that you have all of the welding done and your electric motorcycle frame looks great, let's install the electrical components and start wiring it up your electric motorcycle conversion. Wiring. 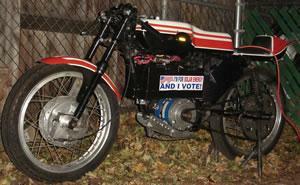 This depends on the electric motorcycle components you buy. See the manufacturers wiring diagrams. Double check all of your connections and tighten every bolt. 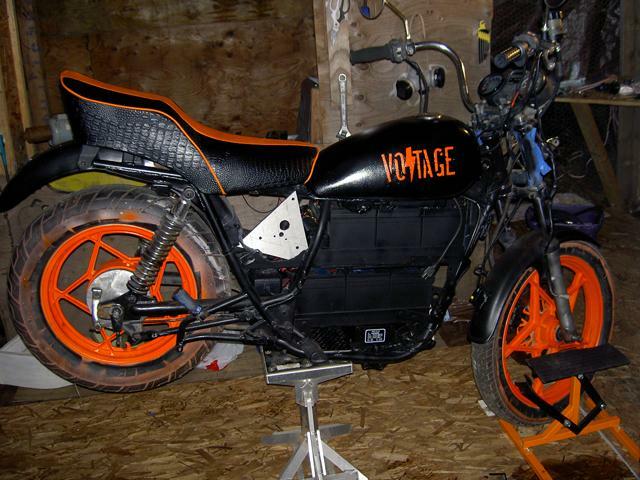 I wanted my electric motorcycle conversions bike to look as good as it rides, so I had all of the panels painted and custom graphics made up by worldsendimages. Using a serial cable and laptop, tweak the electric motorcycle controller program for your riding preferences. 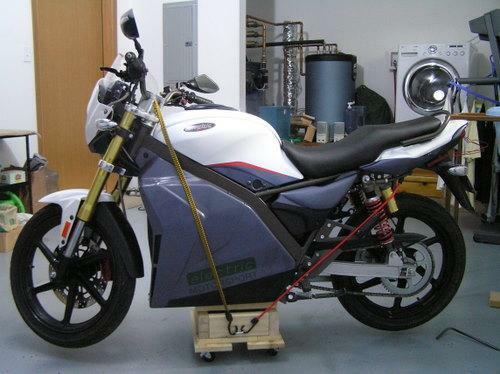 Lastly, I got the electric motorcycle conversion bike inspected and insured. (Be prepared for the dealership mechanics to swarm and hit you with a bunch of questions and jokes about failing the emissions test). 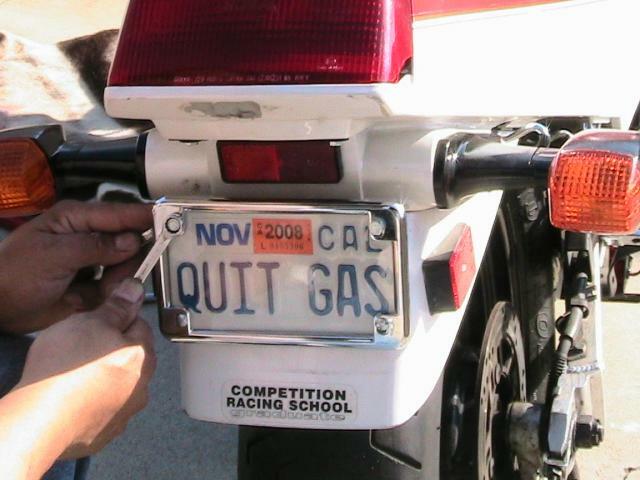 Think about the names given to electric cars and electric motorcycles on the market today. Most, if not all, are a play on the concept of all-electric, zero tailpipe emissions travel. 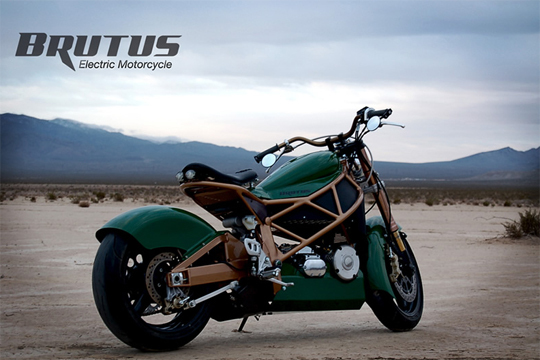 So when we heard about a team of engineers in Henderson, Nevada who were developing a new electric motorcycle called Brutus 2, we had to investigate. Either that, or a working prop from a film set in a post-appocolyptic future, Mel Gibson optional. Designed from the ground up to be the living embodiment of a sports cruiser, Brutus 2 is the first electric motorcycle we’ve seen that caters directly to fans of classic American motorcycles. 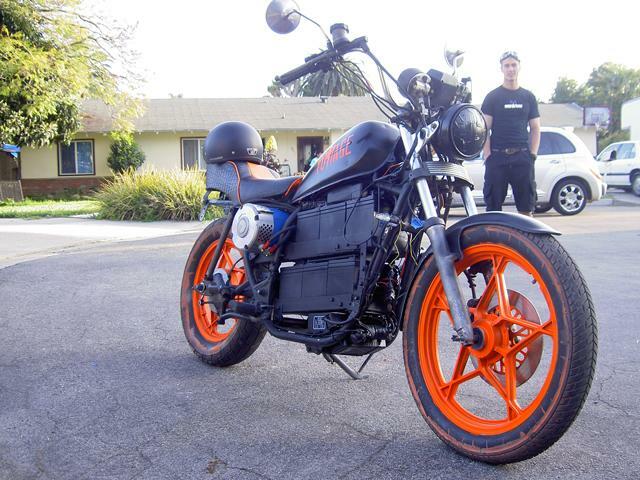 Brutus 2 is also the first real stealth electric motorcycle motor we’ve seen. Unless you look at it closely, it doesn't immediately appear electric. In fact, park it up beside similar gas motorcycles, and we think you’d have a tough time telling it apart from the rest. But as many classic motorcycle fans will tell you, good looks and a tough name will only get a motorcycle so far. In order to be considered a real motorcycle, it has to perform like one. 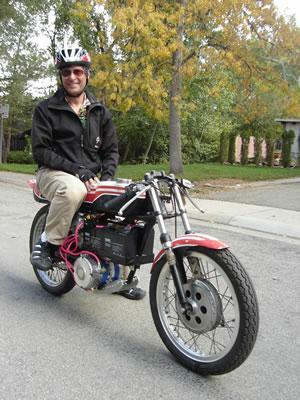 That’s no problem for Brutus 2, claims Chris Bell, the original designer and owner of Brutus Electric Motorcycles. Although it hasn’t had any official range, or performance tests, Bell claims the 535-pound motorcycle can spring from 0-60 mph in around 4.7 seconds, reach a top speed of over 100 mph, and travel over 100 miles per charge. 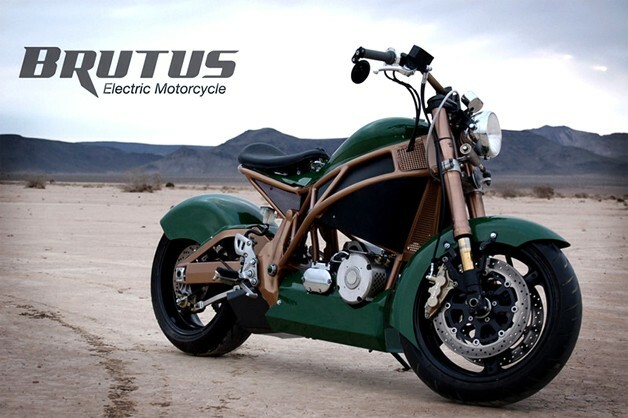 Here’s the catch: while Brutus 2 is certainly an real electric motorcycle motor built for real motorcyclists, it hasn’t entered production yet. According to Bell, that should happen some time this year, provided current deals being discussed with various parts and manufacturing companies are signed. 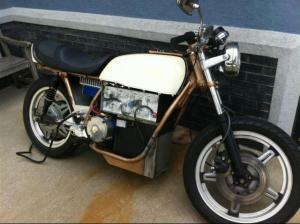 But right now, the all-electric beast is nothing more than an impressive prototype motorcycle awaiting production. Making the case for an electric car - higher up-front costs, but then much less expensive and environmentally damaging to operate - to someone switching from a gasoline-powered car is pretty straightforward. But convincing someone to trade in their Harley for an electric motorcycle? That could be more challenging. There has to be an element of cool. And speed. 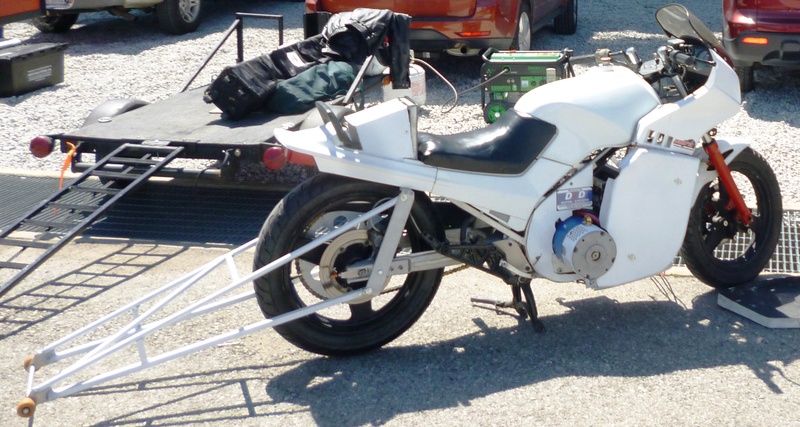 Which is what two Purdue University students and AllCell Technologies set out to produce – and appear to have delivered, with an electric motorcycle that packs 72 kilowatts of power and, according to early tests, can hit 120 mph and cover 120 miles on a charge, according to AllCell. 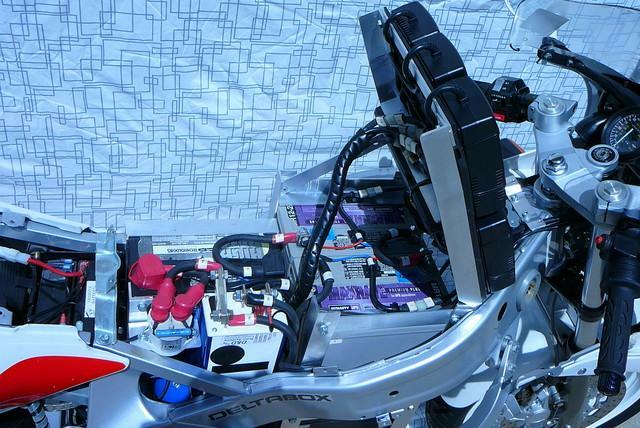 The company said the trick to creating this high-performance bike was in the 10.6 kilowatt-hour lithium battery that uses AllCell’s thermal management material. The phase change material graphite composite (PCM-graphite) controls the impact if one cell has an internal short circuit, and the PCM material absorbs and distributes heat away from the battery, protecting the cells and maximizing battery life. While some motorcyclists might enjoy being daredevils, with this motorcycle riders can let ‘er rip and concentrate on driving without worrying about unnecessary things like an overheating battery. Apart from the battery, electric vehicle experts Tesla Motors and Delphi Corporation also provided support for the project, AllCell said. 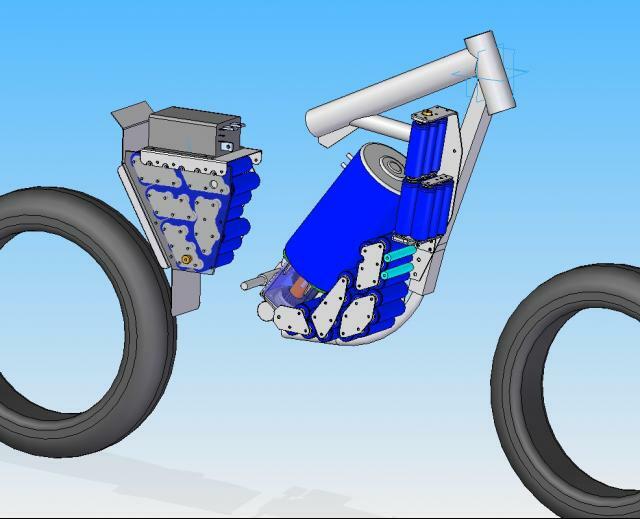 This team is not alone in the quest for the superior electric motorcycle motor. 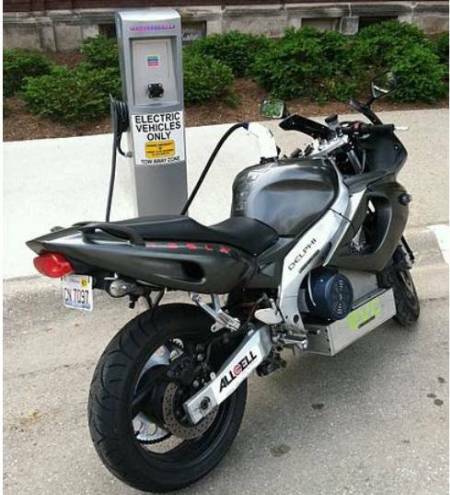 There seems to be quite a trend in motorcycle conversion to electric in garages, notably from a fellow Purdue student who we reported used solar power to power his, yes that’s right, Solar Cycle. Electrics may attract customers who like the idea of two-wheel transport but are put off by the mechanical complexity of traditional motorcycles and the perceived difficulty in riding them. They may also have particular appeal to urban riders and commuters who can operate more easily within the bikes’ limited range. I test-rode an electric sport motorcycle called the Zero S this and week and was surprised by how appealing it is even for someone who loves the chugging rhythm of a Ducati twin or the wail of an old Honda V4. The quiet whir of the electric motor and its impressive off-the-line acceleration made the Zero ideal for city riding, where hearing nearby traffic can be as important as seeing it. While the motor puts out about 28 horsepower, it feels like much more, especially when accelerating from a standstill. I was able to leave menacing taxis far behind and the bike’s weight of less than 300 pounds gave it a light, athletic feel that made getting through midtown New York’s congestion enjoyable. 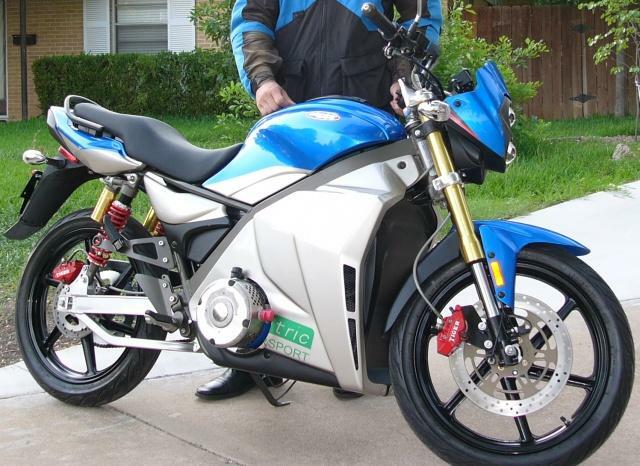 The Zero S has evolved since 2009, when I rode an early version. The new bike is faster, smoother and better-looking than its predecessor and has a tighter, well-finished feel. It’s ready for prime time. As with electric cars, though, high prices could keep some customers away. The S and its on-road-off-road stable mate the DS start at $11,495. The higher-capacity battery that boosts range to 114 miles from about 76 miles with the standard battery also increases the price to $13,995. That amount would buy a Honda CBR1000RR, which is close to being a street-legal racing bike. Of course riders interested in electric motorcycles are not cross-shopping superbikes. But the Zero’s price premium could hurt sales. 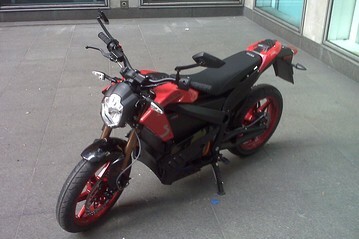 Still, the simple joy of riding the Zero could be as big a selling point as its potential fuel savings. In many ways its design and the way it rides are throwbacks to the minimalism and excitement of earlier motorcycles that drew so many people into riding decades ago. 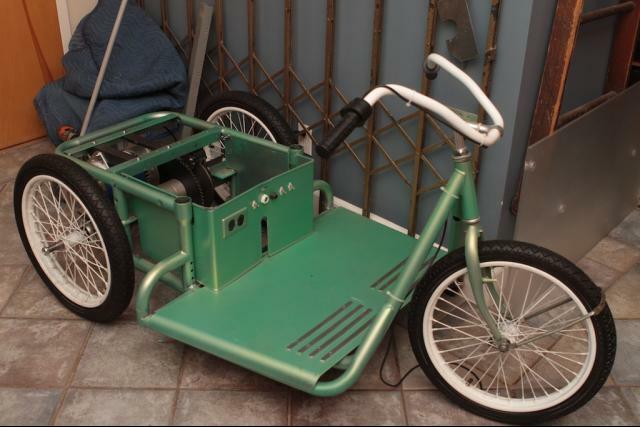 While I tell people that my next new car will probably be electric, a battery-powered motorcycle, in some ways, would be a better fit. 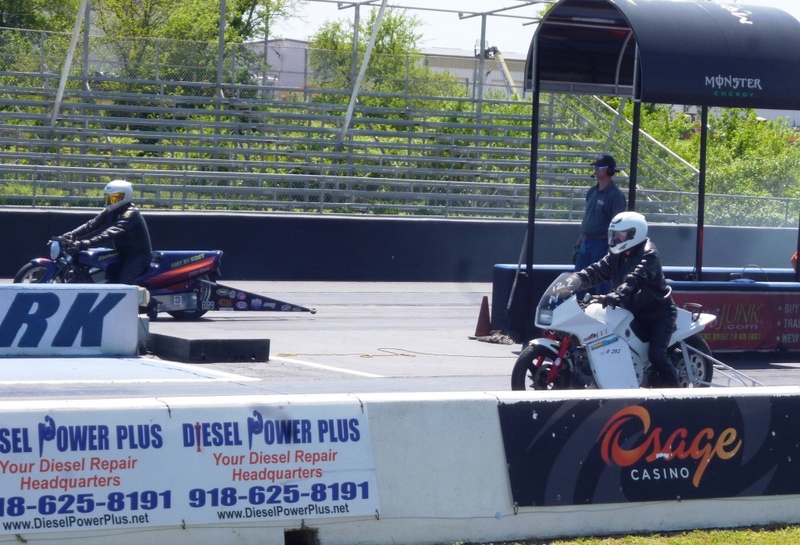 Oakland California USA, Electric Motorsport Inc. has unveiled its two entries for the June/12th Isle of Man TTXGP. 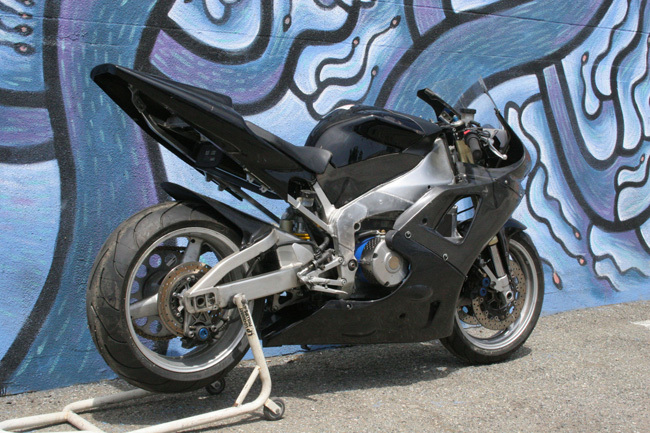 In the open class is a modified production electric motorcycle called the GPR-S. 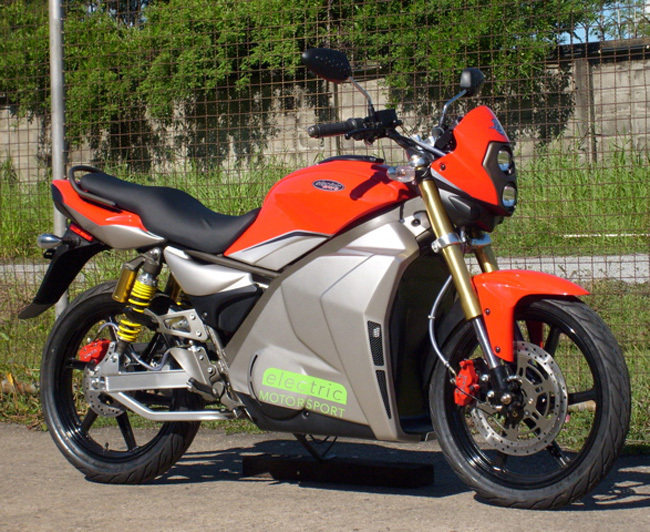 The Electric Motorsport GPR-S were the first Production Electricmotorcycles capable of attaining legal freeway speeds in the USA. In the Pro Class, the entry is the Electric Motorsport R144. 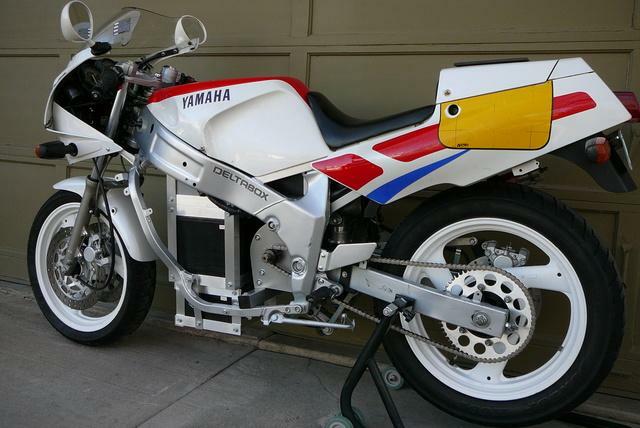 This conversion is based on an R1 race chassis. 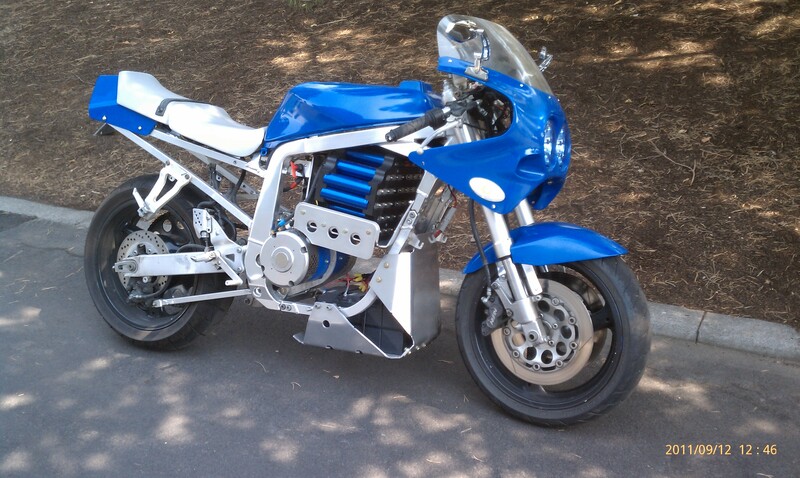 This motorcycle utilizes a high performance electric motor designed and manufactured by D&D Motor Systems, Inc.
Electric Motorsport is a technology company that specializes in Light Electric Vehicles and electric propulsion systems. 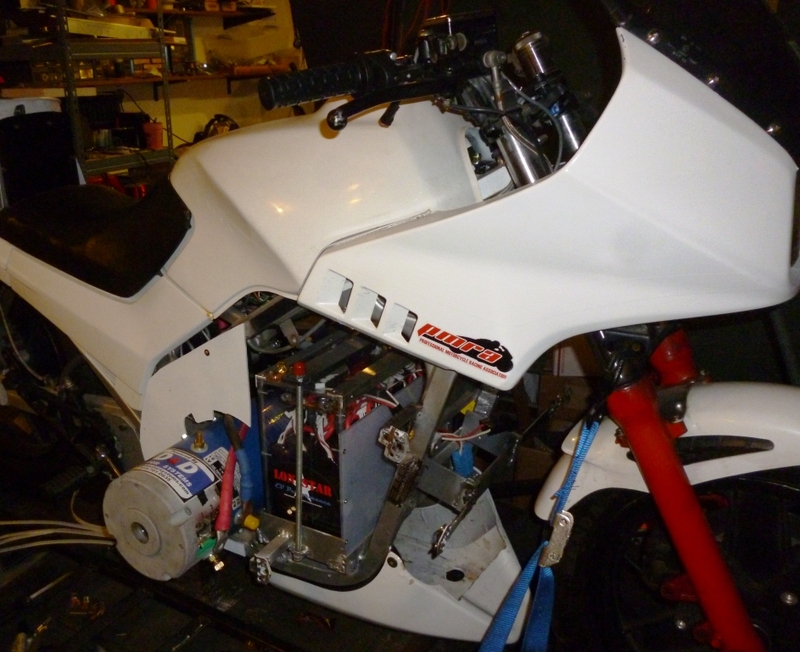 Electric Motorsport is proud to say they have supplied electric drive systems and components to many of the TTXGP teams that will be competing. 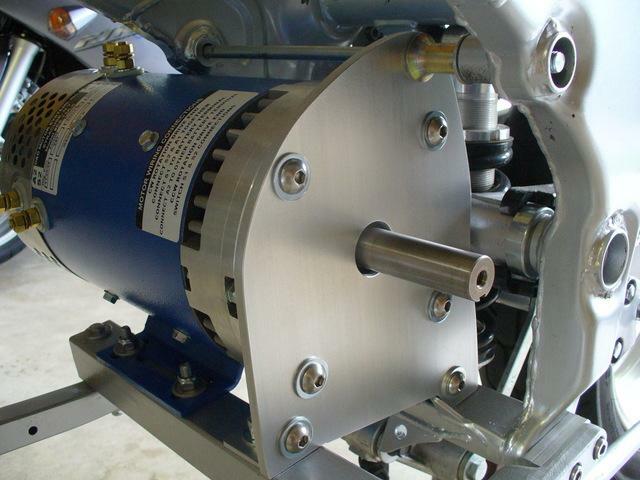 Why does Electric Motorsport supply its competitors with hi-performance electric drive components? Electric motorsport Founder and CEO Todd Kollin says "its mainly to promote the technology and to have some one to race with, and besides we are in the parts business. Racing is just the fun part and its not much fun without competition." 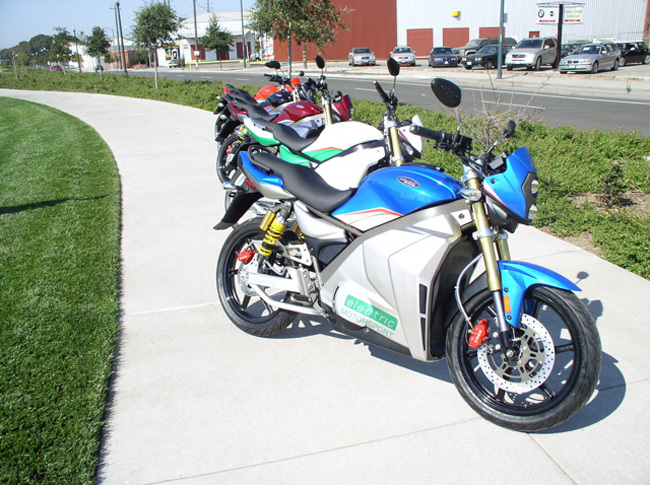 Electric Motorsport Inc has always placed an emphasis on the Electric motorcycle as away of using renewable energy such as solar, wind, hydroelectric, and geothermal to propel ourselves from one location to the next. 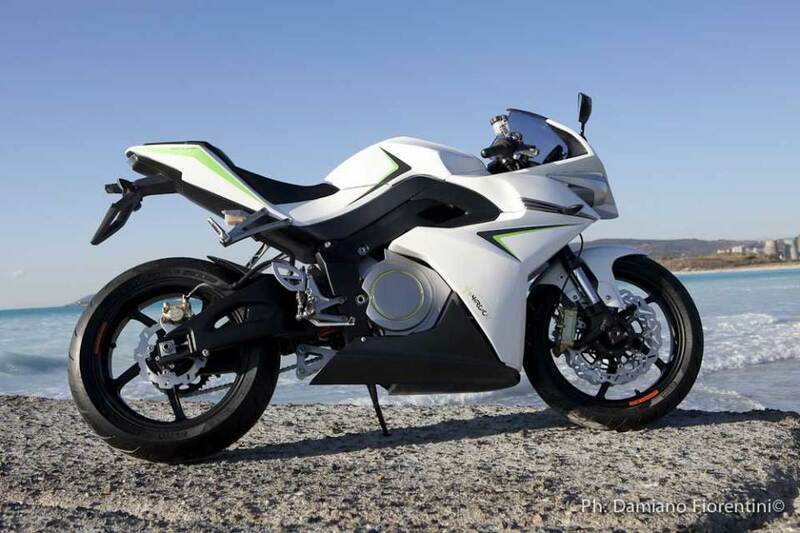 The company has sold 1000's of electric motorcycle conversion kits. Electric Motorsport even sells books on how to convert your old gas motorcycle to electric. 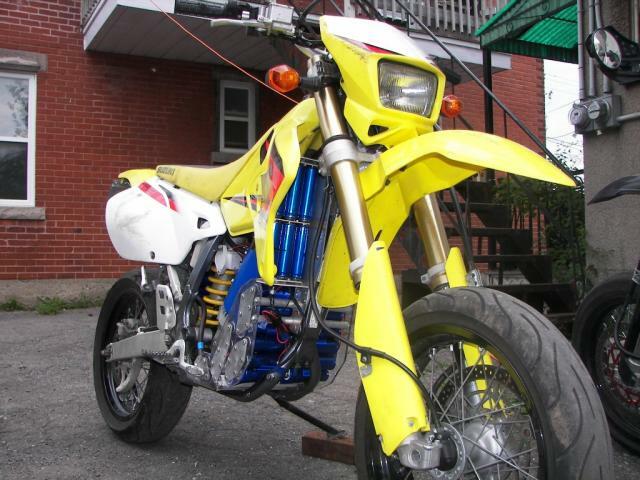 These conversions are great if you have a old bike that does not run so well or has a blown engine. 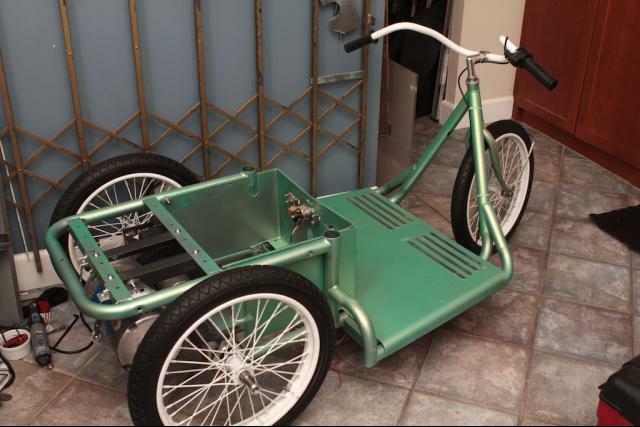 An electric conversion can bring the thing back to life but without having to deal with oil, gas, noise, fumes, warm ups,tune ups, gear boxes, clutches. 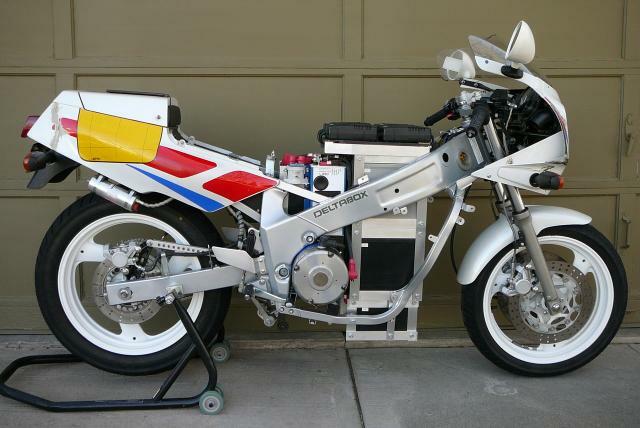 So Honda is getting into the electric motorcycle biz huh? Well, now we know what they plan to do with all the engineering talent suddenly available from their now defunct F1 & AMA efforts. Motorcycle News (via our friends at AutoBlogGreen) says Honda is serious about building a workable Ebike and selling it to the likes of you and me by 2010. Sure, that sounds plausible. Honda has the engineering grunt and it pretty much has the whole motorcycle thing down, so it seems like a lead pipe cinch. Not exactly. Honda faces the same hurdles everyone else does: range and recharge times. I spent some time with an outfit made electric scooters and motorcycles. It was a real geeky operation making scooters and souped-up jobs custom-built to customers' needs, desires and checkbooks. Once or twice a year someone with sacks of money would come in and say something along the lines of "Take my GSX-R and make it electric." We would, but we'd invariably face the same challenges everyone else building EVs faces: range and recharge times. 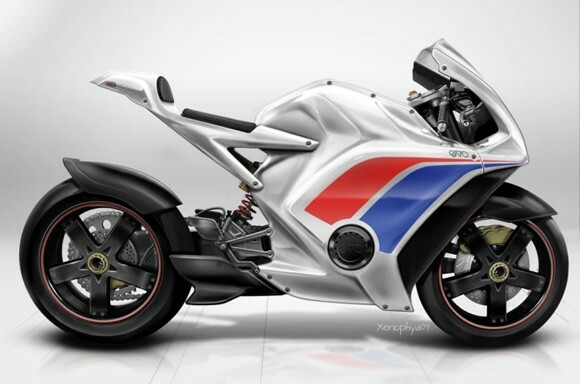 Yeah, we could build an electric GSX-R that would out haul Valentino Rossi - for about seven to 10 miles. Then you'd stop. And then you'd have to plug it in for six or eight or 10 hours. The bike was cool, but not very practical. You couldn't take the thing up some canyon road on your way out of town to Palm Springs for a three day weekend. These will be the same limitations that Honda will face, but in a couple of not so noticeable ways, electric motorcycles play to Honda's strengths. For one, bikes are easy. They're small, light and easy to work on. You can fab up and try things on two or three test mules in an afternoon, and that's an order of magnitude or so harder with cars. For another, Honda is a bike company. Yeah, I know, tell that to Ayrton Senna and Alain Prost and Ron Dennis, but it started out primarily as a bike company (OK, go back far enough and it started out as a piston ring company, but still...) then morphed into a car company. What Honda learns from making an Ebike over the next two years can, hopefully, migrate to cars. 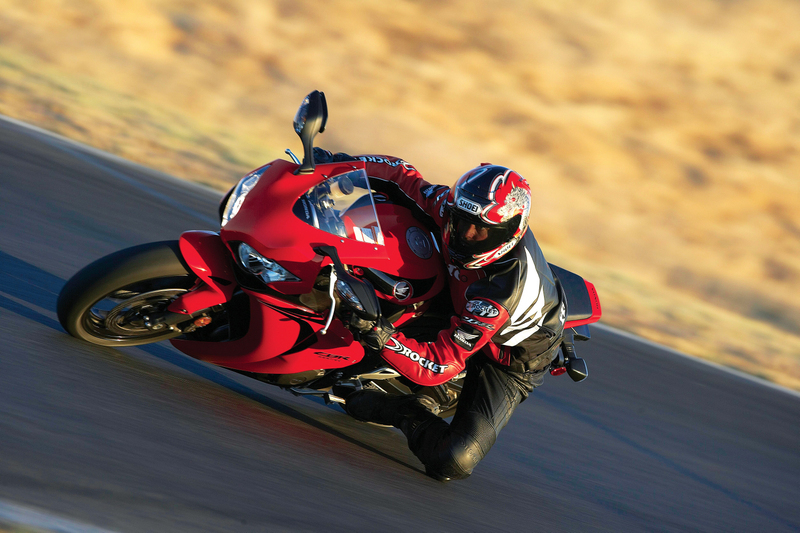 Honda confirms working with bikes is favorable on a number of levels. "History shows that motorcycles remain strong in a difficult market environment and have always supported Honda in difficult times," says CEO Takeo Fukui. "People showed renewed interest in the value of motorcycles which consume less fuel for commuting purposes as well as for their easy-to-own/easy-to-use efficiency." Good point, Takeo. That's another thing bikes got going for them: They're cheap. 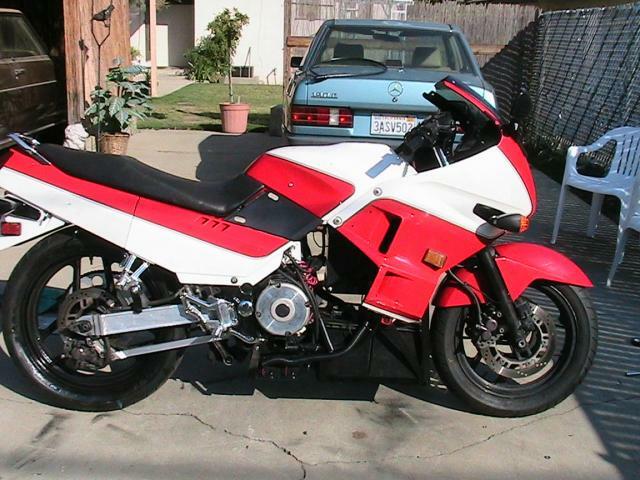 Pound for pound and dollar for dollar motorcycles are the best bet for enthusiast fun. Not for me, of course, because I am comically and frighteningly uncoordinated and that's never a good thing on a motorcycle. But you get my point. Think of what Honda is doing as a real world proof of concept scheme. 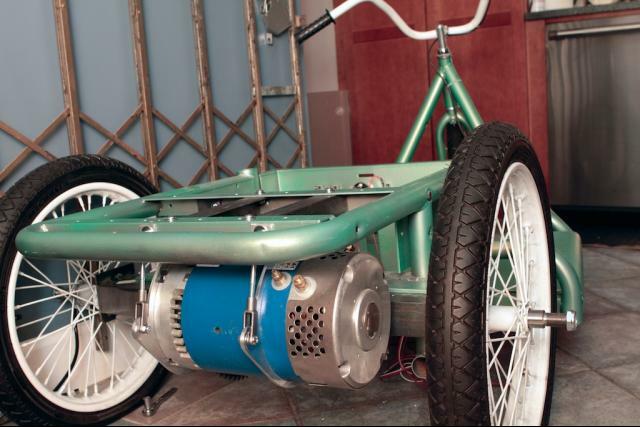 Make an electric motorcycle. Make it work. Make it work better. Then import the technology into a car. Repeat the process.